275 40 22 275/40R22 108Y XL M S PIRELLI SCORPION VERDE PNCS TYRE **8MM**. Condition is Used. Collection in person only. DUE TO SIZE AND WEIGHT COLLECTION ONLY. x2 - 235/55/17 99H - PIRELLI Scorpion STR - Nearly New - 235/55R17 Premium tyre - Bough not long ago Brand New, only driven 2,000 mile max before the vehicle died on me (transfer box) decided the car goes the journey and to recover some of my loses, kept the tyres as they cost me nearly £600 for the x4, there is no kerbing / chinks / like new tyres / no tyre gel dressing to make them look new as they are nearly new, please see many photographs every detail captured. Ready for immediate dispatch with tracked delivery within the U.K. Thank you. x4 New Pirelli Scorpion Verde All Season Tyres 235/65 R19 109V : never fitted. Price includes all four tyres! I have three Pirelli Scorpion Ice and Snow tyres from my Freelander. 1x premium brand, BMW issue run flat tyre. RRP for this tyre new is £200 mail order. Tread depth reads 6.08mm at the tread centre. No uneven wear, weathering or damage to the rim protector. There is a vulcanised puncture repair on the tyre shoulder, carried out in accordance to British Standard regulations. Inflation tested on pressure plates to 50psi post repair, no leaks or bulges. Free delivery anywhere in the UK, dispatched the next working day if payment received before 10pm. Some postcodes may take a little longer but will still be free. Any questions please ask. Returns accepted within 30 days if incorrect order made, but buyer is liable for return costs and original postage fee paid by the seller. 235/60 x 18 - 103V Pirelli Scorpion Verde part worn tyre - tread depth as per pictures - fully examined and pressure tested – this tyre has had 1 puncture repair to the tread area to British Standards BSAU159f:1990. MAKE : PIRELLI P ZERO R01 EXTRA LOAD. SIZE : 295 35 21. 255/45 x 20 Pirelli Scorpion Verde part worn tyre - tread depth as per pictures - fully examined and pressure tested – this tyre has had 1 repair to British Standards BSAU159f:1990. Many other sizes available. All our part-worn tyres are visually checked, inspected and pressure tested. If any of our part-worn tyres have been repaired then our highly experienced tyres fitters have repaired them to British standards. Excellent condition 5.6mm dot code2 0 1 8. 255 50 R19 103W PIRELLI SCORPION VERDE. Tyre Fitting. Tyre Information. UK Tyre Law. Winter Tyres. Useful Links. Related Tyres. Huge Selection of Tyres. PIRELLI PZERO RUN FLAT. SIZE 315 35 R20. TREAD 3.50MM TO 4.5OMM. LOAD INDEX 110. I will ALWAYS try our best to solve any genuine problems for you as soon as possible. MFS o. FR - Special rim protector (Rim ribs). They have been properly warehoused and were never mounted. Should the image above also contain a rim, then it is for illustration purposes only. Nevertheless, the label has been criticized for only showing a very limited number of characteristics. AB31-AB38, AB40-AB56, IV1-IV28, IV30-IV32, IV30-IV36, IV52-IV54, IV63. KW1-KW14, PA21-PA38, PH4-PH41, PH49-PH50, BT. Scilly Isles, Channel Islands, Northern Ireland, Scottish Highlands, Isle of Wight, Scottish Islands, Isle of Man. One Pair (2 tyres) of 255/45 R20 101H Pirelli Scorpion Verde All Season Premium SUV Tyres. The lateral stability and the traction on wet and light snow, ensure all season performances. Scorpion Verde All Season features the M S marking engraved on the sidewall. PIRELLI P ZERO TM NO. 265 / 40 R 21. We will do our best to give a quick and honest response and we are always happy to help with any queries. COLLECTION is FREE from our location inGreat Harwood, Lancashire. Matching pair of premium brand, Land Rover issue tyres. RRP for each of these tyres new is £160 mail order. Tread depths read 6.3mm & 6mm at their respective tread centres. No uneven wear or weathering. One of the tyres has a central puncture repair. Free delivery anywhere in the UK, dispatched the next working day if payment received before 10pm. Some postcodes may take a little longer but will still be free. Any questions please ask. Returns accepted within 30 days if incorrect order made, but buyer is liable for return costs and original postage fee paid by the seller. Very good condition clean Tyre. X1 255 60 19 113V M S PIRELLI SCORPION VERDE ALL SEASON TREAD OVER 6.00mm DOT 1117 NO REPAIRS ( ref 157A ). Photos are of the item for sale. 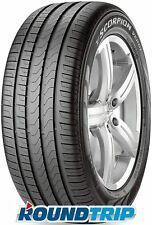 2x 275/45R20 110V XL (VOL) Pirelli Scorpion Verde All Season SUV Tyres. One Pair (2 tyres) of 275/45 R20 110V XL (VOL) Pirelli Scorpion Verde All Season Premium SUV Tyres. The lateral stability and the traction on wet and light snow, ensure all season performances. Scorpion Verde All Season features the M S marking engraved on the sidewall. 1x premium brand, Jaguar Land Rover issue SUV tyre. RRP for this tyre new is £125 mail order. Tread depth reads 7mm at the tread centre. No uneven wear, weathering or scuffs. One vulcanised puncture repair on the tyre shoulder, carried out in accordance to British Standard regulations. Free delivery anywhere in the UK, dispatched the next working day if payment received before 10pm. Some postcodes may take a little longer but will still be free. Any questions please ask. Returns accepted within 30 days if incorrect order made, but buyer is liable for return costs and original postage fee paid by the seller. Make Pirelli. Scorpion Verde All Season. Tread Depth Range. Pressure Tested No Repairs. PIRELLI SCORPION RUN FLAT. SIZE 315 35 R20. TREAD 3.50MM TO 4.5OMM. LOAD INDEX 110. I will ALWAYS try our best to solve any genuine problems for you as soon as possible. Pirelli Scorpion Ice and Snow Part worm tyre. Approx 4-5 mil tread in centre (lowest point). Pirelli Scorpion RUNFLAT 315/35ZR20 '110V' XL BMW . Tyre has One Puncture Repair. 1x275 40 22 275/40R22 108Y XL M S PIRELLI SCORPION VERDE 6mm 2018. Condition is Used. Pirelli Scorpion S/T Mud & Snow Tyre for SUV / Light 4x4. MODEL SCORPION. WIDTH 235. LOAD INDEX 105. PROFILE 55. One Pair (2 tyres) of 295/35 R21 107Y XL (N1) Pirelli PZero Car Tyres. P ZERO is the unique Ultra High Performance product combining Pirelli's knowledge gained from competitive Motorsport with Pirelli's alliance with the top car manufacturers, granting the perfect fit for the performance of each car. 235 60 R18 103V PIRELLI SCORPION ZERO. Tyre Fitting. Tyre Information. UK Tyre Law. Winter Tyres. Useful Links. Related Tyres. Huge Selection of Tyres.